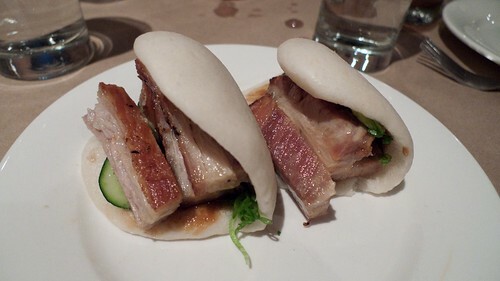 It’s Day 2 of Momofuku Week at Inuyaki and today’s post on Pork Belly Buns is a great way to use the Pork Belly I wrote about yesterday. The Momofuku pork buns quickly (and inadvertently) became one of Noodle Bar’s signature items, and it’s nice to be able to recreate them at home. It’s basically a steamed bun with slices of pork belly, quick-pickled cucumbers, hoisin sauce, and green onions. My wife decided to pickle both cucumbers and carrots, and she julienned both instead of slicing them because it would be prettier. The recipe for the steamed buns is in the book (link below), but I didn’t have time to make them, so I picked some up in the freezer section of a local Asian supermarket. They’re a little too thick and not as good as fresh, but they did the job. The second time I made this, I found a different style of buns in the refrigerated section of the market that were bigger and rounder and accommodated 2 slices of pork belly easily. Steam the buns for a couple minutes until they’re heated through. While the buns are steaming, cut 1/2-inch slices of belly across the grain and warm them up before using—I grilled them in a cast iron skillet for about a minute a side. Depending on how big your buns are, you may have to cut the belly slices in half to get them to fit on the bun. 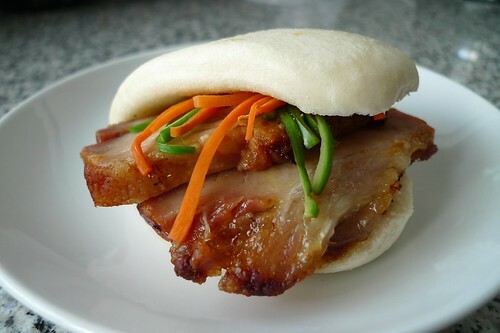 To assemble the pork belly buns, open up a bun and brush some hoisin sauce on top and bottom halves. Put the pork belly slices on the bottom half and pickled cucumbers and carrots on the top half. Garnish with a little green onion and eat immediately. For reference, here’s what the pork belly buns look like when the restaurant serves them up (from our trip to Noodle Bar in September). can I post? hope so! Thanks for checking, JulieK. I think my tech issues are now solved. Nice writeup! There was a guy who posted on chowhound looking for the steamed buns to replicate the buns. 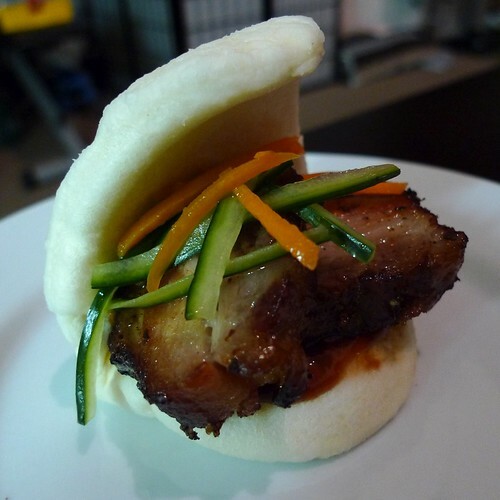 Damn, that first photo of the pork belly buns… has me drooling. O_O I can’t stop fixating on it. can anyone recommend a good brand for hoisin sauce? I usually buy Lee Kum Kee. Tomukon Noodle Bar in Ann Arbor makes these too, except the pork belly tastes like pork adobo (Filipino style). In China, the pork belly tastes like adobo too, not Hoisin. It complements the pickled veggies well. THANKS for posting this!